The Shiloh Shepherd dog began development in 1974 and is still in development today. The breed was brought into existence by a German Shepherd breeder, Tina M. Barber, who wished to recreate the dog she remembered from her childhood in Germany. The breed is being bred for stable temperament, large size, and exceptional intelligence. Today the breed is somewhat rare but makes a fabulous family pet as well as livestock guardian, search and rescue dog, and therapy dogs. 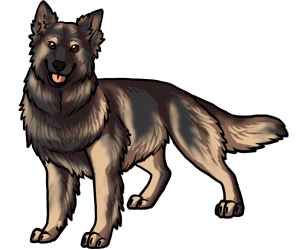 The Shiloh Shepherd's average lifespan is slightly longer than the German Shepherd breed. A Shiloh Shepherd by the name of Gandalf recieved national media recognition in 2007 when he found a lost boyscout in North Carolina. The Shiloh Shepherd is only recognized by rare breed organizations and has not yet been able to be accepted in major kennel clubs. Every year the Shiloh Shepherd Dog Club of America holds a "homecoming" for Shiloh Shepherd owners where informal shows and activities are held.